Hear me out: Turkey? Stick it in an oven for hours. Mashed potatoes? Boil some water. Yams? Sprinkle some brown sugar. Green beans? Open a can. Even hand-whipped whip cream? Yep. That, too. Whip it. Even if you end up making a Half-Trifle Half-Shepherd’s Pie Rachel Special, “what’s not to like?” Joey will eat it. We like to make Thanksgiving a big deal. Sure there are more mouths to feed, more places to set at the table, more potatoes to peel, but it’s not any more difficult than a single crème brûlée. A good mole? I have no idea where to start. In the same way, there are some of us who still think that digital content creation—a video, a blog post with an image, a podcast, a visual meme, a musical track, an image collage—is a big deal. I am here to say that like Thanksgiving, it isn’t that hard. In fact, digital content creation has never been easier. We don’t have to wait until next year for Facebook to provide us with another 30-second video with five of our photos. We can make our own in just about the same amount of time it took to watch it. This last winter, my nephew was performing at an Open Mic with his brother for the last time before he left on a two-year service stint. As I watched the performance, I took snapshots and recorded a couple of the songs. And as I went up to the bar to order a hot chocolate, I opened Animoto on my phone, selected a couple of pictures and a snippet or two of the video, typed a couple of words. The only difficult thing was hearing the background soundtrack options while listening to my nephews. Before their 15-minutes were up, I had posted the video as a farewell gift on his band’s Facebook page and emailed it to our extended family who were not able to be in attendance. Both of these image apps allow the user to combine text with image. In WordFoto, you choose a photo, choose or type in a list of words, and viola! If you want to get fancy, you can also manipulate the image: choose a color scheme, crop the image, change the density of words. I began using both of these apps this summer while I was working as a facilitator in the National Writing Project’s Connected Learning MOOC. This image is a photo of my niece who was going into 1st Grade using an iPad to make words. The words were I imported were from the Connected Learning principles we were discussing that summer. In Over, you similarly choose an image, manipulate it as desired, and add words and/or graphics. The words and graphics come in style packages created by artists. Some of these are free and others can be purchased. This image was also created in my work with the Connected Learning MOOC (or #clmooc for short). 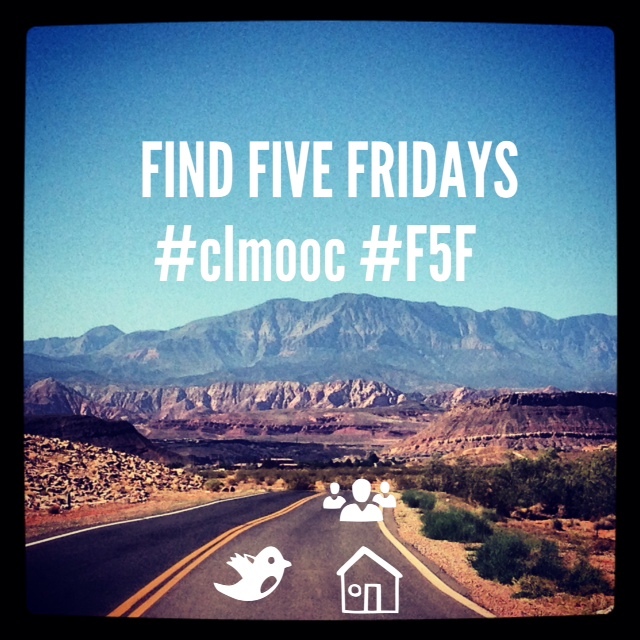 For our MOOC, I had begun a weekly curating activity that I called Find Five Friday (lots of results of #F5F are posted here). Each week had a different theme of five things to “find.” When I posted this image to announce that week’s #F5F, I received a chiding tweet in response subtly suggesting that I should “cite & credit.” I was flattered! They thought that a photo I had taken on my phone and designed with a couple of clicks was someone else’s! I had the pleasure of tweeting back that it was all mine. Later in the summer, my niece and I used Over to create our own pages of a book we were reading at the library. On VoiceThread, composers sequence slides with audio, text, image or video. These can be imported or created on the spot on the website. Then, those with a VT account can respond to each slide, and can do so with the same features–audio, text, image or video. The idea is that by the end, not only is a multimedia slideshow created, but an interactive conversation between media and persons has developed. Below is a VoiceThread I designed as a part of an ongoing collaboration with Kevin Hodgson (@dogtrax) that we called #modigiwri (More Digital Writing, after #digiwrimo, or Digital Writing Month, which ended too soon for us). I described how I learned about VoiceThread, and how I composed each of the elements I created for this VoiceThread on the Digital Is website. Add Your Favorites in the Comments! To create each of the elements of this VoiceThread I used other platforms and apps like QuickTime Screen Capture, iMovie, Windows Media Maker, Garage Band, and on and on. The point is that there is a plethora of digital tools to use for content creation that are easy to get the hang of, and pretty inexpensive (or free). There are so many that have become part of my working repertoire that I can’t even remember all of the tools I use. Just glancing down at my devices I see that I haven’t mentioned VisualPoet, HaikuDeck, Prezi, Padlet, lettrs (used in this post), and Notegraphy (used to make the image below). 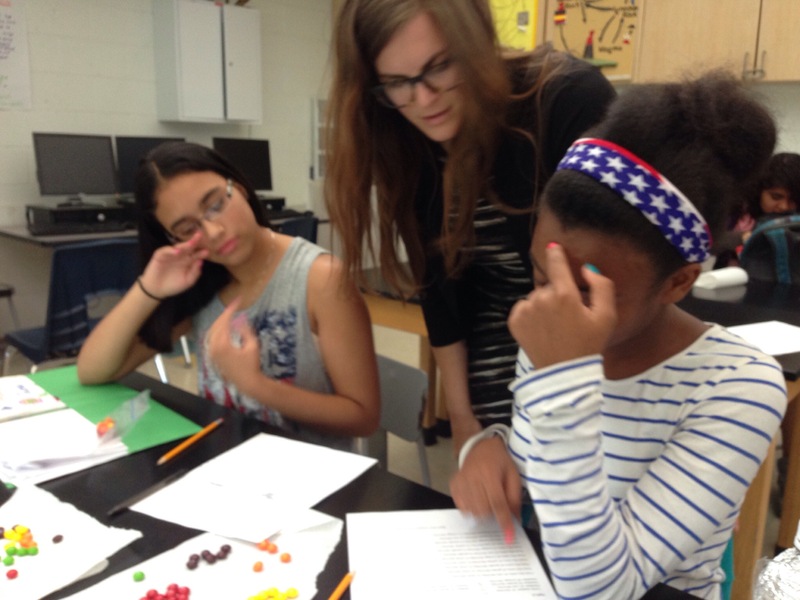 Previously, my grad students have posted their favorite tools for use in the classroom, and I have written about some of the tools I use, as well. So, what are your favorite tools and platforms? Please add them in the comments below. I think these visual apps are great resources for the classroom, and not just for students but also for teachers. I’m constantly trying to inspire my students (I teach at-risk kids) with uplifting or thought provoking quotes and I love the idea of overlaying it on a picture using Over. It’s much more engaging that way. I’m fairly new to using apps in the classroom as I previously taught in a very poor inner-city district in California where we were lucky to have overhead projectors! These resources have given me lots of ideas for the classroom. I will have to look into the above mentioned apps. I have downloaded and tried several apps only to be disappointed. I don’t remember the names of the apps because I deleted them. I have a huge problem with image sharing on the web. I refuse to put my image or that of students’ on something so public. The apps I tried did not allow me to save the work I had done privately. The work had to be shared on the apps’ site or on another social media site which I will not do. I was forced to delete the work I had done along with the app. My experience with those types of apps has been a waste of time. So, my question to you is about privacy. Have you come across fun apps that can be saved onto your media device, apps that do not require sharing of any kind. I need some that respect people’s privacy in an age where there is no privacy. Do apps like that even exist? I am going to have to try out these apps. They look like a great way to motivate students. 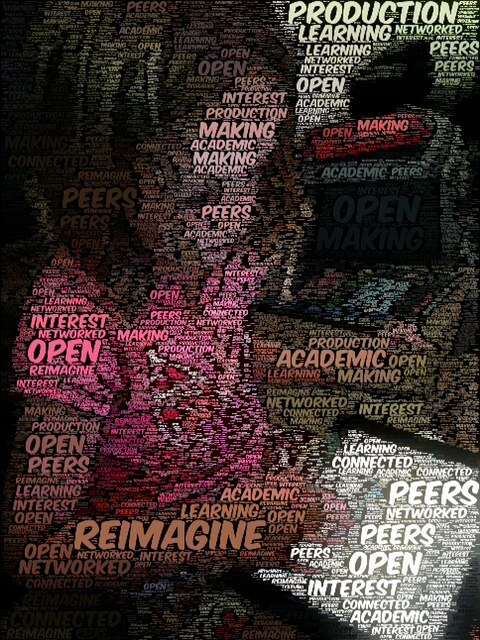 The Wordfoto and Over app would be a great way to teach and review science and social studies curriculum and vocabulary. I can’t wait for my students to create projects about our curriculum using these apps. Anna has always been one of those thinkers that can whip up a meaningful and creative idea. Then she furthers it to fruition. We go way back. Anna… What spurs you on every morning? Is it the student, the unknown written material, events, …. Have you used Telligami? (Sp). So fun…. Words, graphics, and photos melding together! Ah ah…. Yes digital can be as easy as Thanksgiving dinner but we humans are demanding IT to be even more interactive with less fuss and more meaning. Our future generations… What can they expect???? Can’t wait to see you and hear how life has written your story! It was great to reconnect tonight, Bridget! I love these questions. I think I’m going to have to write a whole new post to answer them. I appreciate your words of encouragement to us “non-techy” people. I know that the only way to feel comfortable with apps is to give them a try and not be afraid to try things. I am usually pleasantly surprised when I let the fear go. It seems like now days we try to make everything more difficult that they need to be. Someone wise once pointed out that for many of us our first digital technological devices came with thick instructional manuals and were easily messed up and even broken with the wrong use. Technologies now are designed to make instructions unnecessary. We are supposed to figure out the tech through its use. And the tools and software (or apps) aren’t really “breakable” in the same way. They bounce back and reboot and such. It means we can play with a whole lot less fear.